The deadly bombing of a church in Pakistan’s north-western city of Peshawar is unprecedented, but not entirely unexpected considering the community’s history in the country, explains the BBC’s M Ilyas Khan. Until now, Taliban militants have mostly targeted the places of worship for Muslim minority sects in Pakistan such as Shia Muslims and the Ahmadi sect. But attacks against the Christians are not uncommon. Some of these have been related to Pakistan’s controversial blasphemy laws, while others appear to have a political motive. In recent years the assassination of two high-profile Christian politicians also put the plight of this minority in the spotlight. 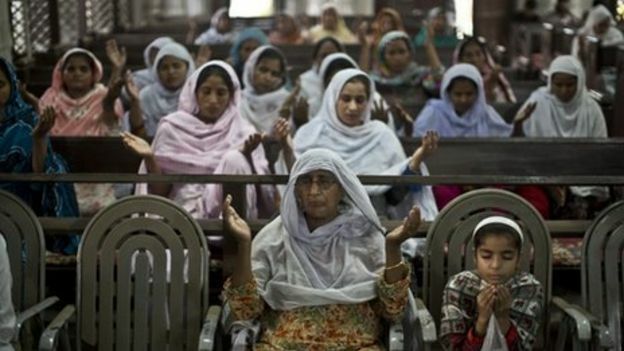 After Hindus, Christians are Pakistan’s second-largest minority group representing about 1.6% of the country’s overwhelmingly Muslim population. Large populations are in the southern metropolis of Karachi, and there are countless Christian villages in Pakistan’s heartland of Punjab, in Lahore, the city of Faisalabad. In the deeply conservative north-western province of Khyber Pakhtunkhwa province there are, according to one lawmaker, 200,000 Christians, of whom 70,000 live in the city of Peshawar. The majority of Pakistan’s Christians are descended from people who converted from Hinduism centuries ago under the British Raj. Most of those converts had been low-caste Hindus, kept at the lowest rung of society by virtue of their birth and would have converted to escape the fate destined for them within the caste system. Under the Raj many of these converts provided labour in garrison towns – and every cantonment city has an area known as Lal Kurti, traditionally the area where Christians reside. But to this day the Christian community remains in the poorest sector of Pakistani society, consigned to menial jobs. Entire villages in parts of Punjab are Christian, with inhabitants working as labourers and farmhands. There are sections of Pakistan’s Christian community that are well off and they came over from Christian Goa under the Raj, are more educated and mainly settled in Karachi. Many of their descendants still work in the corporate sector. What all of them share is a sense of vulnerability with a number of the wealthier Christians leaving to settle in Canada and Australia as the climate of intolerance in Pakistan becomes more unbearable – and if some Muslims are thinking of leaving, Christians and other minorities will feel the pressure more acutely. Pre-partition Pakistan was a much more diverse place and levels of tolerance have declined as Pakistani society has been increasingly Islamicised and more homogenous. Pre-partition Christians could count themselves among minorities that made up 15% of the population. Now minorities fall short of 4% of the country. And with the introduction of Islamist militancy, their situation is that much more urgent. Since the 1990s, scores of Christians have been convicted for desecrating the Koran or blaspheming against Prophet Muhammad, although experts say most accusations are fuelled by personal disputes. While most of them were awarded death sentences by lower courts, the sentence was often set aside by the higher courts due to lack of evidence, or because the complainants in the case were found to be targeting the community for economic benefits. Perhaps the best known example is that of Aasia Bibi, a Christian woman from a Punjab village who in 2010 got into an altercation with some Muslim women of the village and was later accused by them of having blasphemed against the prophet. Then Punjab governor Salman Taseer, who publicly stated that the law had been abused in Aasia Bibi’s case, was murdered by his police guard. Months later, the country’s minister for minority affairs and a leader of the Christian community, Shahbaz Bhatti, was assassinated for speaking out against the law. The Pakistani Taliban claimed responsibility for that murder. Two years later, a minor Christian girl, Rimsha Masih, became the first non-Muslim to be acquitted by a court in a blasphemy case when it was discovered that she had been framed by a local Muslim cleric. Accusations of blasphemy have often led to mob violence against Christians. 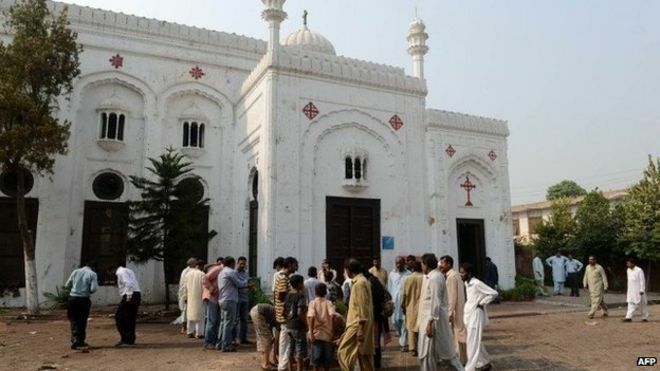 In 2005, hundreds of Christians had to flee their houses in Faisalabad city after one of the residents was blamed for having burnt the pages of the Koran and the entire neighbourhood was attacked by a mob wielding axes and sticks. Several churches and Christian schools in the city were set on fire. In 2009, in Gojra town of Punjab, nearly 40 houses and a church were burnt by the mob, and at least eight members of the community were killed, all burnt alive. Mostly Muslims and Christians co-exist amiably enough without frequent outbreaks of animosity, going to each other’s festivals, sharing community spaces. Some of the violence against Christians is directly related to the American-led war in Afghanistan, so has an expressly political motive. Months after the US-led coalition attacked Afghanistan in late 2001, a grenade attack on a chapel inside a Christian mission hospital Taxila city killed four people. A couple of months later, gunmen executed six workers of a Christian charity after tying and gagging them at their third-floor office in Karachi. These incidents, though isolated, have continued down the years. It is too early to say which category Sunday’s church attack in Peshawar belongs to, but its timing may be of some significance. It has happened at a time when Prime Minister Nawaz Sharif is about to land in New York on his first visit to the US and the United Nations. Analysts say the Peshawar bombing will overshadow his visit and raise questions among the international community over his country’s commitment to fight militancy. This appears to be a repeat of an earlier attack by the militants in which at least nine foreign climbers, including three Chinese, were killed at the Nanga Parbat mountain in June. But it is the first large-scale attack against Christians which appears to mimic recent deadly assaults on minority Shias in Pakistan. But the dynamic with that particular enmity is entirely different. Shias in Pakistan are seen as influential and high profile with positions in the military and playing prominent role in the country’s cultural life – they are caught up in what many analysts call a proxy war between Shia Iran and Sunni Saudi Arabia. Pakistan’s Christian and Hindu minorities evoke public sympathy and are not tools of a larger sectarian and ideological battle. They look like part of a militant plan to send a message to the West or embarrass Nawaz Sharif when he heads in that direction.